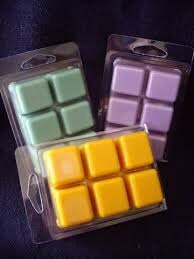 These wax melts / tarts are packaged in a clamshell that holds 6 tarts. Each package weighs approx. 3 ounces. By 4 packages and get the 5th package free. Just tell me which fragrance you would like for free in the shipping notes. Below is the beginning of the list of fragrances. These are all of the fragrances beginning with the letter D. I will have a listing for each letter. The photos are stock photos and are a representation of the actual product. We offer wax melts and candles in all of our 700+ fragrances. If you would like a brochure with all the fragrances available please contact me and give me your email address if you want it sent electronically. Or mailing address and we will send you a brochure out in the mail. If you want candles or wax melts in a fragrance that you cant find a listing for please contact me and I I will either get it listed for you or set up a custom order. These premium soy wax melts have a fabulous fragrance. We add as much full strength premium fragrance oil as the wax will hold in each melt. We color each one to match the fragrance, if you have a color preference or prefer plain white let me know and I will make it for you. Each melt last between 6 & 10 hours depending on how you use it. Ours are tested in an electric wax melter and last nearly 10 hours. The fragrance stays true and one tart is enough to fill a large room with fabulous fragrance. notice the fragrance fading you can add a few drops while the wax is liquid to make them last much longer. The fragrance is what fades, the wax does not burn (if you are using a proper melter) the wax can last for 50+ hours. This saves you the cost of purchasing the same wax melt scent over and over as well as having to empty (which is quite easy) the melter as often. We use 100% Soy Wax (soy) grown in USA by American farmers & Premium Fragrance Oils. Each wax melt is made by me, the Nana of Naturals by Nana. WE USE CALCULATED SHIPPING ESTIMATING THE WEIGHT - SIZE - AND DESTINATION OF THE PACKAGE, IF SHIPPING SEEMS TO BE TO HIGH PLEASE CONTACT US SO WE MAY MAKE ANY ADJUSTMENTS THAT ARE NEEDED. AS WITH ANY PURCHASE MADE THROUGH THE MAIL IT MOST OFTEN ADDS VALUE TO ORDER MORE THAN ONE ITEM AT A TIME,. MANY TIMES WE USE USPS FLAT RATE BOXES THAT CAN FIT MANY ITEMS AND NOW WITH THE NEW PACKAGING MANY MORE THAN BEFORE. AS ALWAYS WE WILL REFUND ANY OVERCHARGE IN SHIPPING OF $1.00 OR More. will give us the opportunity to earn your business. We are a customer service driven business and strive very hard to never disappoint. Please feel free to contact me with any questions. Thank you for considering us for your wax melt needs. Love the fragrance. First time using soy melts so I don't know if using soy opposed to non soy, affects the bonding of the product. Or if the bonding issue is a manufacturer issue. The product does not stick together very well. Had to use a knife to cut product from the square in order for product to stay in a solid piece. A++: shipped quickly, great communication, delicious scents!